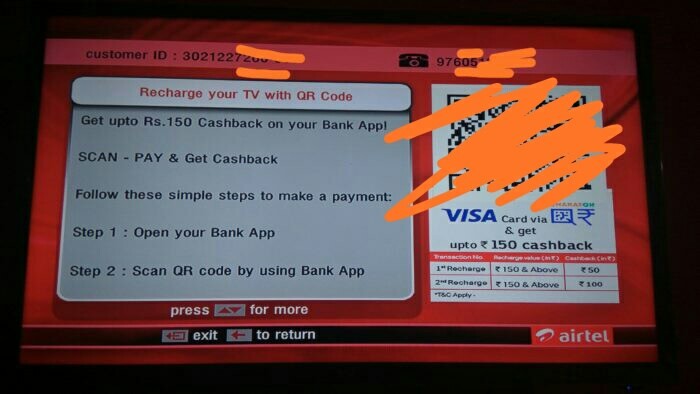 Airtel DTH – Get upto Rs 150 Cashback on First two Transactions using Bharat QR (Visa card only). Here is an amazing offer for Airtel DTH users, Now Get Rs 50 Cashback on 1st transaction of Rs 150 and flat Rs 100 cashback on 2nd transaction of Rs 150 or above. Max cashback is ₹150. Valid only for Scan & Pay transactions. Valid only if you pay via VISA cards only. So Hurry up !! 1. First of all, Press Yellow Key on your Airtel DTH Remote. 2. Now Press “OK” button on “Recharge your TV with QR Code. 3. Now a QR Code will be displayed on your TV screen. 4. Just Open the Payzapp App and Scan the QR Code and Enter amount as Rs 150. 5. Now Select only VISA Card and make the payment. 6. You will get the Rs 50 cashback on first payment of Rs 150 or above. 7. Now initiate again a Recharge of Rs 150 and get Rs 100 Cashback. Scan the QR Code on TV Screen (Press home button on Airtel DTH remote and Select ‘Account Summary’) using PayZapp app. Max cashback ₹150. Valid only for Scan & Pay transactions. Cashback will be auto-credited to respective VISA cards used within 30 working days after the successful transaction. The relevant cashback amount shall be credited into the account of the Promotion Cardholder within 30 (thirty) days of the applicable transaction. Visa cardholders are not bound in any way to participate in the discount offer. Any such participation is voluntary. In case of any dispute with a Promotion Cardholder the decision of the Promotion Partner shall be final and binding. Do you know how to find qr in Internet box? There is no such QR in its software. I have tried searching for it. you didn’t get the QR Code in Airtel DTH TV? This offer is not valid on airtel website! I an unable to see this offer in Payzapp. Is this offer still live? Its not a Payzapp offer. Its a Airtel offer with Bharat QR Code payment. Amazon? Do you mean airtel?